ARE YOU FED UP WITH YARDS OF garden hose strewn all over the yard, plastic hose reels that hold up just long enough for the warranty to run out? To get a truly lasting hose, you probably think you have to buy one of those heavyweight multi-core hoses that are guaranteed not to kink, wear out, burst, or do magic tricks. What if I told you there was a solution to this dilemma? What if I told you there was a choice between the red hose and the blue hose? The RED hose weighs a lot, but it won't kink or burst and is hard to move around. The BLUE hose is super-lightweight, still won't kink or burst, and can be rolled up into a small package you can carry with one hand. If you are like most of us, then you probably gave serious consideration to the BLUE hose but, ended up going with the RED one. Why? Because the blue hose sounds too good to be true. But, if you take a minute to look at the BLUE hose, you will find that what we are talking about, is the very latest in expandable hose technology. Far from those “As Seen on TV” products of a decade or two ago, modern expandable hoses have a lot to offer as long as you know what to look for when buying one. You might think that the expandable hose is a modern invention. After all, it takes special materials and polymers to make an expandable hose, doesn't it? Today the answer to this would be yes, but no so far back in the annals of history. 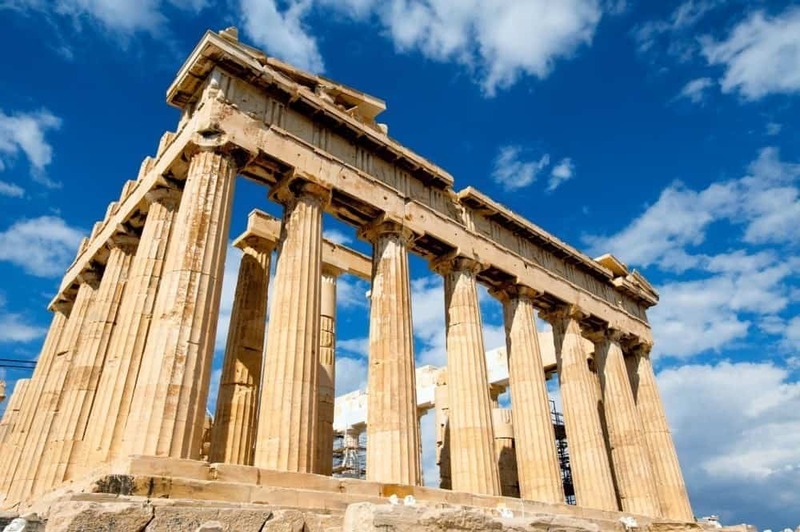 Some several thousands of years in history, the Greeks are known to have been the first ones to create an expandable hose. Their hoses were made from animal intestines as part of the Greek War Machine. The Greek sailors would spray “Greek Fire” onto their enemies from these hoses, setting the sailors and their ships on fire. But, today using animal intestines like this might get you in a lot of trouble. So instead, we rely on modern technology to develop an expandable hose for us. Let's take a look at the construction of expandable hoses along with what you should be looking for when you are ready to buy your first expandable garden hose. Today's expandable hose consists of an outer shell made from either a synthetic or cloth weave material. Inside is a latex hose made from a material that can expand up to 5 times its original size without bursting. The inner hose expands as it fills with water until it presses up against the outer casing. Rubber hoses do not have the ability to shrink or expand, they are designed to be tough enough not to break or crack if they freeze or split and rupture when they get too hot. If you buy an inexpensive rubber hose, you end up one that collapses and kinks at the drop of a hat. Expandable hoses are designed not to kink or twist. There are many different brands of expandable garden hose on the market, and each of them claims to use the best materials to create the finest expandable hose on the market. How much of that is true, we are going to look at. Because the materials used are the most important part of any expandable garden hose, let's start by taking a look at the different materials, their advantages, and disadvantages. Today's expandable garden hose has an outer shell made from a woven polyester fabric. The term Deniers is used to measure the strength of the material being used. The measurement is based on the thickness of a single strand of silk. This measurement is used to describe most forms of natural and polyester fabric. Obviously, the higher the denier count the less prone the material will be likely to rip, snag, tear, and damage caused the sun's UV rays. Most expandable hoses have an outer shell made from 500 Denier polyester. If you see a hose made from a material with less than a 500 Denier count, you may want to keep shopping. The benefit to using a cloth-like material is that it will expand and contract easily, allowing you to roll the hose into a small flat package. There are two different types of inner core used in today's expandable garden hose, latex and TPC (thermoplastic copolyester). Each of which has their own advantages. This type of inner core is crafted from natural latex and can be made in a single, double, or triple layer construction. The more cores the longer the hose is likely to last longer than most other types of hose. The layers are thin enough to remain completely flexible even when cold. Thermoplastic copolyester is a man-made highly elastic and flexible material that is not only used to make hoses, it has many other uses. Manufacturers say it offers excellent heat resistance and high durability ratings. One of the most common differences between the different expandable garden hoses is the number of layers the inner core is made from. You are likely to hear that a triple layer core is stronger and better than a double layer core. But, under independent testing, both appeared to be equally strong. Layered latex is created by dipping an existing latex tube in molten latex and then letting it cool. The number of times it is dipped the higher the number of layers. Each layer is intended to add strength to the original pipe, but at the same time, each layer added reduces the amount of flexibility the finished product has. Some manufacturers use a special type of polymer for the outer layer instead of more latex. Among the most common combinations is a latex core with thick outer PVC layers. The good news is that all of the options make an excellent choice for your next expandable garden hose. There are many great benefits to replacing your old rubber or PVC hoses with the latest in expandable garden hoses. Lightweight – did you know a long rubber hose filled with water can weigh up to 50 lbs.? An expandable hose typically weighs less than 5lbs with no water in it. Water drains out – the water automatically drains out if you leave the end open. Easy storage – no hose reel needed, you can hang these hoses on a peg out of the way. Reduced kinking – by their design, these hoses are naturally resistant to kinking and tangling. Expands – this is the biggest advantage of all, these hoses expand to three times their size when filled with water. And they go back to their original size when you are done. Quality control does seem to be a problem with some manufacturers, be sure you buy your expandable garden hose from a reputable manufacturer with good reviews. People don't read the instructions and get confused about how these hoses work. That's about it as far as cons go. Once these hoses were more of a joke than they were a useful product. Thanks to major advances in technology and materials, today's expandable garden hoses are well-worth investing in and will certainly take the strain off your back moving them around. With all of this in mind, I took a look at many of the different expandable garden hoses out there before I chose the ones I am currently using. Here are my five picks for the best Expandable Garden Hoses available today. This expandable garden hose features a double inner layer TPC core, brass fittings, and expands to 100 feet. This is three times its original length. 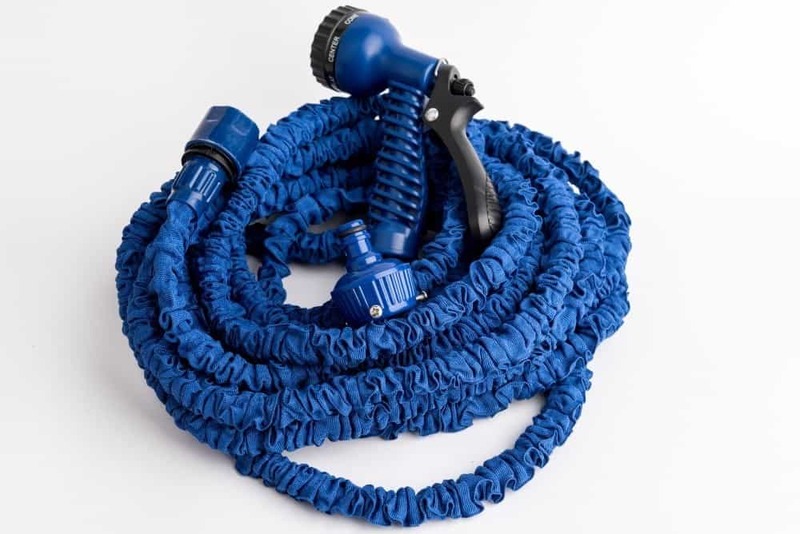 The hose is extremely lightweight, making it easier for you to carry it around the yard. The included spray nozzle offers eight different spray patterns and comes with 2 spare rubber washers. This expandable garden hose starts out at 17 feet and expands to 50 feet when filled with water. Weighs an incredible 1.85 lbs. The inner core is made of latex and PVC and all fittings are made of brass. The hose is covered in a high-quality polyester cloth wrap for added strength. Comes with an 8-pattern spray nozzle, and a rust-free shutoff valve. The FlexiHose expandable garden hose is long enough to be convenient without being ridiculously long. It comes with 3/4″ solid brass fittings and a double latex inner core designed to handle water pressures up to 12 BARS. Collapsed size is only 17 feet, but it expands to 50 feet when filled. Comes with a lifetime replacement guarantee. Comes with an 8-pattern spray nozzle. This expandable garden hose goes from 16 to 50 feet under pressure and will quickly return to its original size when you are done with it. The inner core is made from latex and is covered with a 5000D high-quality fabric outer shell. Fittings are solid brass for maximum durability. This expandable hose also comes with a lifetime warranty from the manufacturer. This FitLife expandable garden hose is available in four different sizes, 25, 50, 75, 100foott lengths. It features the strongest triple latex inner core, solid brass fittings. The 3/4-inch inner diameter provides you with plenty of kink free water. Comes with an 8-position spray nozzle. Burst-tested to 145 PSI/10 Bar and endurance tested for 1100 to 1200 uses to ensure quality. Can't think of a single reason why you would want one, after all the good things expandable garden hoses have to offer. But, here is one you might find fits in with your needs and tastes. This non-expandable garden hose is made from FDA and NSF certified polyurethane resin. This means you can use it to water your garden or to supply you with drinking water. It contains no BPA, lead, Phthalates, or any other form of toxic chemical. All brass fittings and remains flexible in sub-freezing temperatures. This hose can also handle hot water to 140°F. Or in this case, maybe not a kink at all. Expandable garden hoses are more than worth the cost but, be prepared as few of them perform quite as well as advertised. Yet they are still better than lugging a heavy-duty rubber hose all over your yard. I hope this information helps you find the right hose for your garden needs. Have information you would like to see here, drop me a line here and I might add it. Don't forget to tell your friends if you like what you see.